The sister of a woman killed after a chase with Milwaukee Police that ended in the Kinnickinnic River said her 2-year-old niece did not have to die. "I don't understand. I don't understand," cries Kristin Nehmer at her Milwaukee home. "She had a really good heart. She made a bad decision, but she was 19." 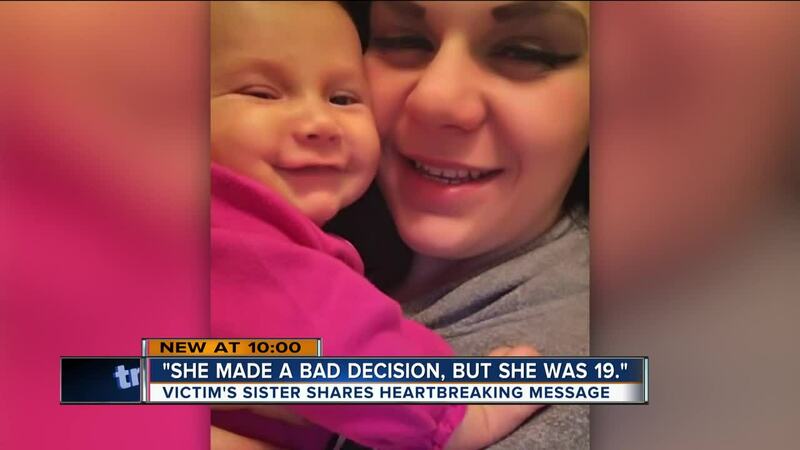 She does not know how sister, Shannan Nehmer, 19, could have had her daughter with her as she ran from police. Shannan Nehmer was pulled from the river on New Year's Eve and later died. On Tuesday afternoon, Milwaukee Police divers recovered the bodies of her daughter Annamellia and another adult male who has not been identified. "I can't imagine why she would have her daughter with her when she is doing things like that. That's like the hardest part," said Nehmer. Milwaukee police say they were chasing an SUV that the mother and daughter were in along with another man around around 8:30 p.m. on Monday. Police Chief Alfonso Morales said they were suspects in several armed robberies. He said officers tried to stop the SUV they were in when they took off and ended up in the river. "We believe just ultimately ran into the dead end. The East Greenfield deadends into and crosses with the Milwaukee River. We believe the vehicle just drove whether they knew or didn't know the street ended. They drove right into the river," said Morales. "I would hope that people who are her age and were close to her will learn from this because the youth is hell-bent on doing what she was doing and this is what can happen," said Nehmer. Nehmer said the reason she is speaking out now is to is to make sure nothing like this happens to another family. "It's so hard because I have two two-year-old myself and I always pictured them growing up together and now, that's not going to happen," said Nehmer. Milwaukee Police said they plan to have a news conference to update the case on Wednesday.